Cahir Castle in County Tipperary, Ireland, is one of the most beautiful medieval castles in the country. On this page I will talk about the history of this Irish castle. Because of the fertile soil in the Southeast of Ireland, much of the land here was conquered by the end of the twelfth century. English kings as well as the Normans became very active here from then on. In 1192 by King John granted this area of Ireland to Phillipp of Worcester who started building a castle here in the early 13th century. He was succeeded by his nephew William Worcester. 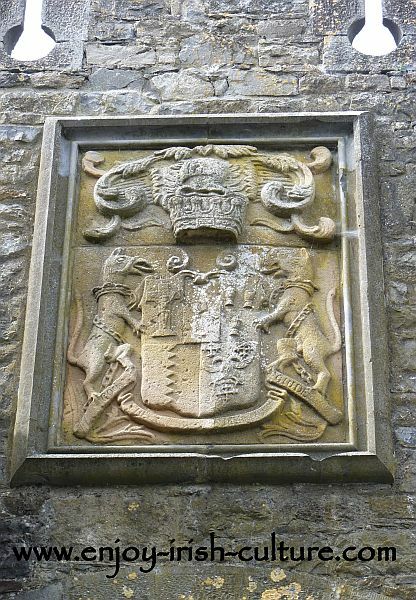 The Worcesters married into the DeBermingham family who held the castle until 1375 when it was granted to James 3rd Earl of Ormond who was the head of the Butler family. The castle at Cahir, apart from a few short episodes, remained a Butler castle for the next six hundred years. The Butler family arrived in Ireland in the latter half of the twefth century. Their original family name was Fitzwalter. Theobald Fitzwalter had been part of the early Norman invasion. He had grown up being fostered in the same household as Prince John and accompanied the prince on a trip to Ireland. Later, he married Strongbow's daughter Isabel. Butler was an acquired family name describing a title held by the head of the family in court- ‘butler to the crown’, 'boitellier' in Norman French. This ritual role involved serving wine to the king after a coronation. It was a huge privilege in the court and the role came with very attractive entitlements to duty payments of ten percent on all wine imported to Ireland. This right was held by the family for over three hundred years until the English crown bought it back in the 1800’s. 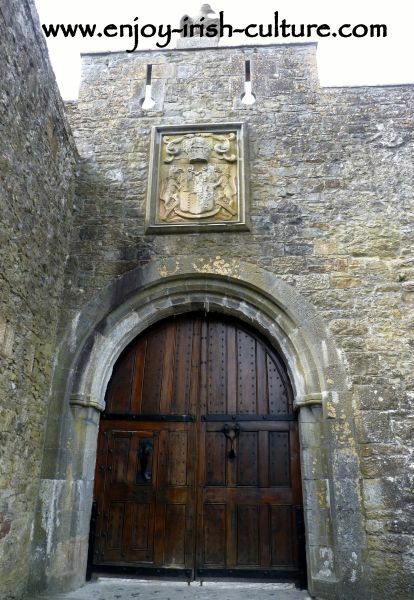 The Butlers coat of arms above the castle gate shows a crucifix on the top right which relates to their Catholicism. Three goblets relate to the role as butlers to the crown, and underneath that you can see three Jerusalem crosses because another relation, Hubert Fitzwalter took part in the third crusade in the 1190ies before he became Archbishop of Canterbury. Most of the existing castle was built in the 15th century, although there are some later 18th century additions to the castle that can be recognised easily because they were built in red sand stone. This Castle was built to be an extremely safe stronghold. It was said to be the most impregnable castle in Ireland. Hence, it was taken by force only once in 1599. Two cannon balls are still embedded in the castle walls as a reminder of that episode. In 1599, Queen Elizabeth I sent the Earl of Essex over to Ireland with the goal of defeating Hugh O’Neill, Earl of Tyrone. The successful three day siege of Cahir Castle was part of this campaign, but the Earl of Essex did not have much luck with Hugh O'Neill. 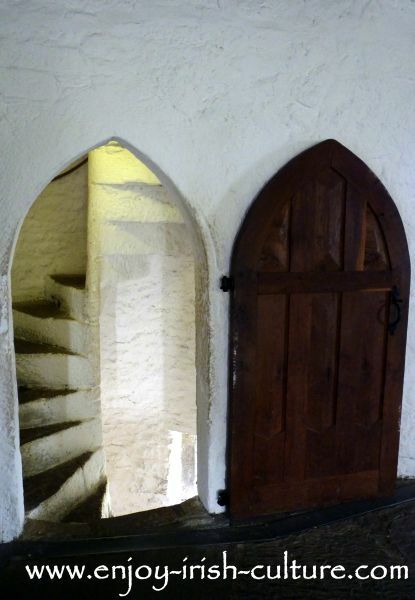 On his return to London the queen was outraged at his performance and had him imprisoned in the Tower and executed there two years later, while Cahir Castle was handed back to the Butlers. In 1650 Oliver Cromwell arrived in Cahir. The Butlers surrendered and handed over the keys- just as well because otherwise the castle surely would have been destroyed by the assault guns used by Cromwell's army. The Butlers, who were very adaptable and good negotiators, regained control of the castle some 12 years later even though they managed to remain Catholic beyond that date. 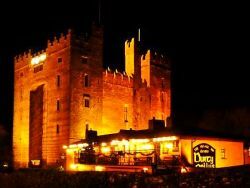 Later, when the era of medieval castles concluded, the Butlers built a mansion in the town centre of Cahir where they lived from then on. But the castle remained in their possession until 1961 when the last of the family died without any heirs. This Irish Castle was purchased by the State and became a National monument in 1964. The castle was beautifully restored. It houses pieces of genuine medieval furniture. This is one of the largest and most striking of the castles of Ireland, with stunning features such as a working portcullis, cannons, and beautiful crenelations. 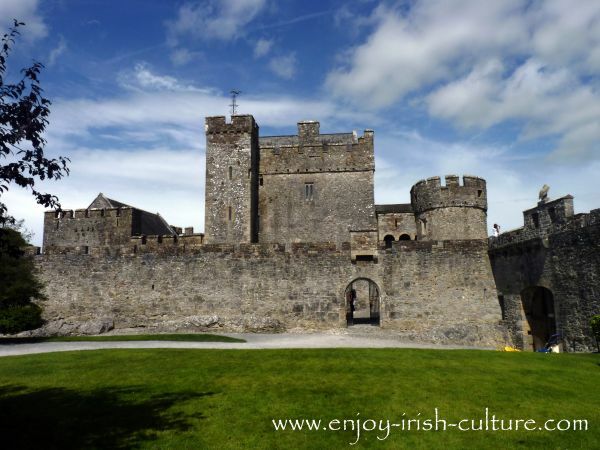 Visiting Cahir Castle is a must for anyone who loves castle visits. We hope you enjoyed our piece on the history of Cahir Castle which is one of our favourite Irish castles! If you did, and if you like what we do on this website, please kindly spread the word using social functions!